The Rotundus robot is a rather unusual spherical bot that moves using an internal pendulum. The robot was originally designed for planetary exploration at the Ångström Space Technology Center, part of Uppsala University, Sweden. It is a sealed ball with no external moving parts exposed to regolith or vacuum. Now, the designer is repurposing it for security duty here on Earth. There are two main principles to get a ball rolling on its own - to rotate a mass inside the ball or to displace its centre of mass. In order to move the pendulum is lifted in the direction of travel, the centre of mass gets displaced in front of contact point between the ball and the ground and the ball starts rolling. Turning is accomplished by moving the pendulum to either side. The finished version of the Rotundus robot will navigate using an internal GPS sensor and will be navigable by a remote operator. Ultimately, the goal is to make it an autonomous robot that can patrol a perimeter, or go practically anywhere a person could go. 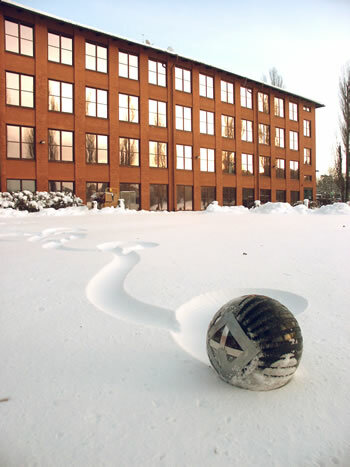 The robot operates equally well on sidewalks, sand or snow. On a hard surface, the robot can achieve speeds of up to 20 miles per hour. Update 21-Jan-2009: Take a look at this Rotundus spherical robot video. I saw this story about the Rotundus security robot prototype about a month ago, but I couldn't quite think of what it reminded me of. Thanks to an alert reader, I've got it! 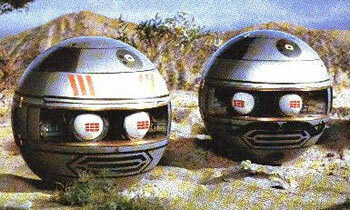 The Rovers from the late 1960's sci-fi television series The Prisoner were security balls of various sizes. 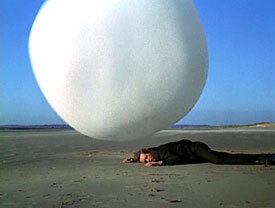 In the television show, the Rovers were living creatures modeled to some extent on blowfish. They could alter their size and were equipped with toxins that could incapacitate prisoners who tried to escape (they would give chase to the fastest moving living creature). They could run faster than a man, just like the Rotundus robot. They also served as eyes and ears for the Village monitors. They were adapted for different environments, including undersea use. Also, in the early 1980's supermacromation series The Terrahawks, spherical robots called Zeroids were used to fight the evil witch-like alien Zelda.